A HUGE RIVERBOAT is moored at Clat Adams Park in Quincy. It's called "America." It's on a two-week cruise from Wisconsin to New Orleans. Last Saturday the boat slipped past us in little old Quincy, headed for a stop in Hannibal. Of course! Hannibal! You can't deny Hannibal has Mark Twained its way as a destination stop, and God bless 'em for it. The boat came back to Quincy, and the crew and all 180 passengers have been here since. I will give Quincy credit for showing hospitality - the tourism people have gone to great lengths to arrange transportation and tours, and a lot of America's passengers wandered around downtown Saturday afternoon. I talked to four or five groups (a couple even came into the store), and most of them just wanted to know the location of the dollar store. Rodney gawks at the boat. Still, our restaurants reportedly were jammed Saturday night. Plus Clat Adams park is the place to be right now in Q-Town - we went down there last night and there were a lot of people curious about the big boat, wanting to get a look for themselves. It was really nice to see people in the park and gawking at the big boat. This comes right as the city is exploring riverfront development options. 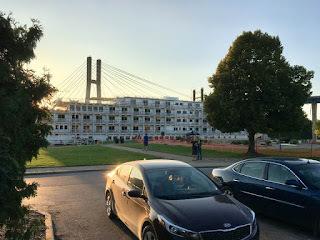 I've long said Quincy's forefathers completely missed the boat and did a poor job of planning when it came to our riverfront, but it's easy to point it out now. Wouldn't it be nice if the riverfront was a destination for us who live here, and attract tourists? The challenge is that it will cost a lot of money. So where does it come from, and will Quincy be willing to foot its share of the bill? I support it, but I'm wary of the expense, too. It's the world we live in these days. I hope the folks on the America have enjoyed their unexpected stay in Quincy, and here's to hoping we someday get boats like this docking in the Q-Town on a regular basis. Why does stuff break? Just because.